Violence has erupted during the second stage of state elections in parts of Indian-administered Kashmir, where thousands of troops have been deployed. Two protesters were shot dead on Saturday in the town of Baramulla. 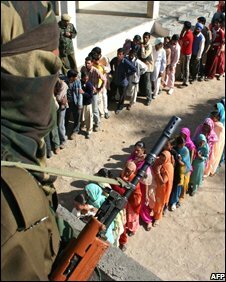 Separatists are boycotting the polls, which are being held district by district to facilitate policing. The separatists argue that the polls strengthen India's hold over the region. The Indian-administered area of Kashmir was put under federal rule in July following the collapse of the state government over a land transfer deal for a Hindu shrine. Voting was temporarily halted in Kurhama, a police official told the Associated Press news agency. Protesters had reportedly tried to prevent voters entering a polling station. In Baramulla, , 55km north of Srinagar, a teenager died when security guards protecting a candidate's motorcade opened fire on protesters throwing stones, AP reports. A man was later shot dead when protesters clashed with police. Voting in the state is being held in seven phrases, lasting until 24 December. The counting of ballots will begin on 28 December. An unusually strong turnout in the first phase of the elections on Monday took everyone by surprise, the BBC's Altaf Hussain reports from Srinagar. The turnout in Muslim-majority constituencies was slightly more than 50%, with many Muslims voting despite not accepting Indian rule in their troubled state. Six districts were voting on Sunday, accounting for about 500,000 of the state's 6.5 million eligible voters.